A4A 2017 Status of Air Travel in the U.S.
With 2017 extending the safest period in aviation history, Airlines for America‘s 2018 Ipsos Air Travelers in America survey found more Americans than ever are flying—almost 90 percent in their lifetimes and almost 50 percent in the past year. 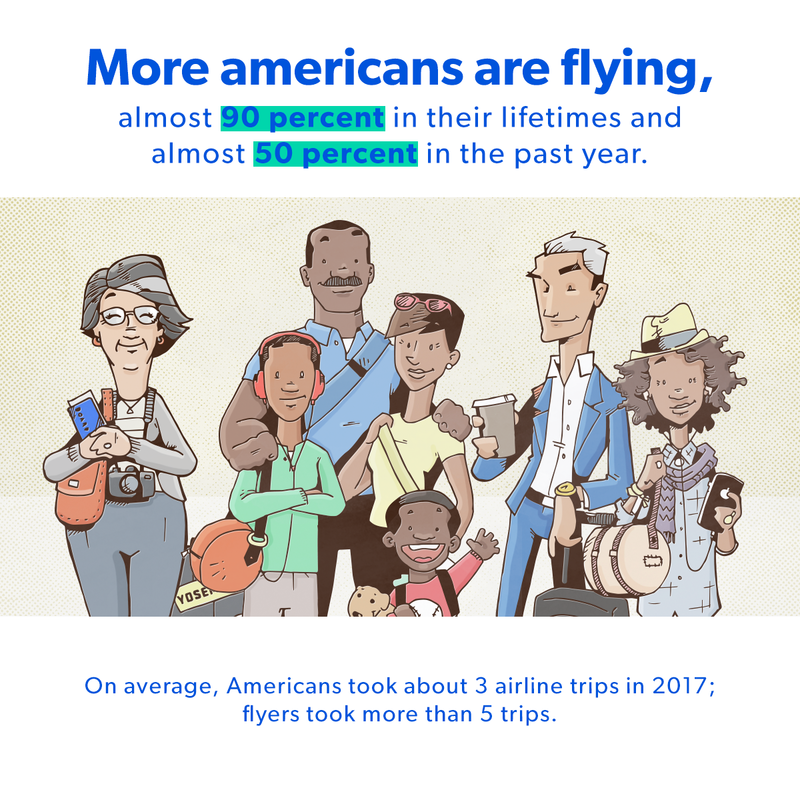 That’s up markedly since 1977, when just 25 percent of Americans reported flying that year and only 63 percent reported ever flying in their lifetime. For the third year in a row, over 80 percent of passengers said they were satisfied with their air travel experience. Additionally, satisfaction among air travelers enrolled in “trusted traveler” programs Global Entry and TSA Pre✓ continue to report high overall satisfaction compared to unenrolled passengers—86 percent reporting satisfaction with the air travel experience compared with 79 percent of unenrolled passengers. 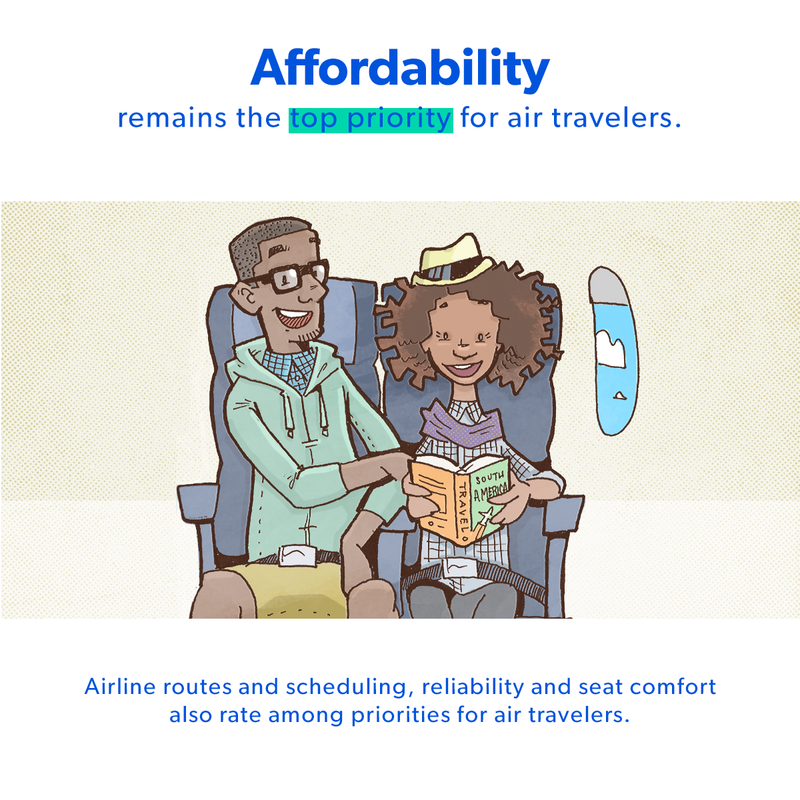 When choosing which airline to fly for personal travel, affordability remains travelers’ top consideration. Flight schedules, on-time departure and arrival, and seat comfort also rank highly among what travelers are looking for when they book personal travel. Business travelers ranked airline frequent flyer perks first, edging out flight schedules and affordability. Click here to read our full Ipsos 2018 Air Travelers in America press release. Click here to read 2017 survey highlights. Click here to read 2016 survey highlights.